This post is amazing. You touch on an issue that’s been increasingly a part of my life–how do I show support for others who have “been in the trenches’ in some way, when the “trenches” I’ve inhabited are so very different? How do those of us who want to change things for the better for others do so without looking like glory hounds–presumptuous people who have wrapped themselves in the trapping of a movement without ever having been personally touched by the pain that has precipitated the movement? In my writing classes we talk about Charlie Hebdo, and the millions who affirmed that they “were Charlie,”–without ever having really considered what being Charlie Hebdo might mean. We talk about the Black Lives Matter movement, and look at the events that led to its formation. And in doing that, we come face to face with exactly what you’re talking about–how do those of us who want to help let those who need our help know that we’re here, and ready? More important, how do make ourselves ready? In writing this, you’ve done us all a service. I hope you consider publishing this piece more widely–it’s very helpful. The best people for supporting those in other trenches are those who know what it is to be in a trench. Better still when they understand, and give latitude for trenches being similar – and yet different. We wind up supporting each other eventually, and that’s the way it should be. Good to hear from you. I’ve thought, but am don’t know where this post could wind up with the right exposure to the right people, except to those I know on social media. 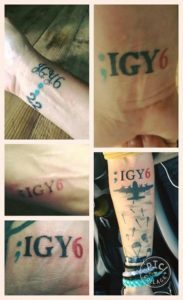 Would somebody reach out and contact me, I am the President of IGY6 Foundation and the guy who put ;IGY6 our there, basically created ; IGY6.